Currently, the ability to associate contacts with multiple companies is not available in Nimble. A contact can only belong to one company at a time and we'll display the company in the header of the contact record. Nimble offers the ability to automatically sync relevant contact data from the contact's online social presence. If the contact's work history is available on their social profiles such as Twitter, AngelList, Google+, Foursquare, etc, this information will appear in Nimble in most cases. 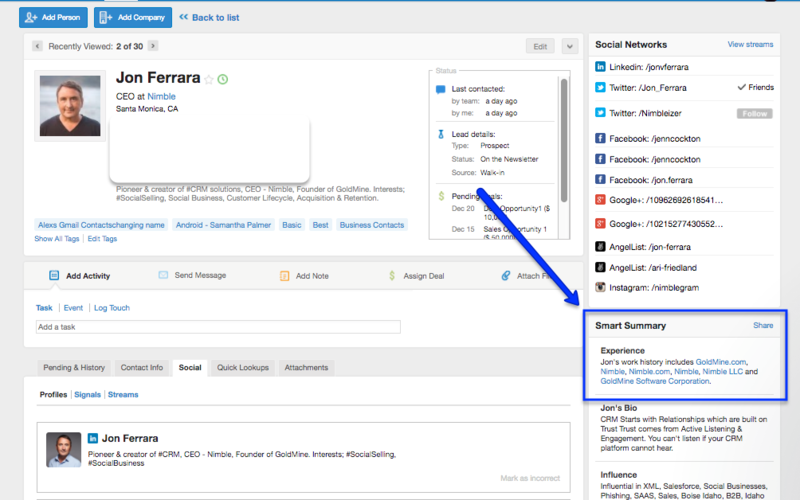 Work Experience will appear in the "Smart Summary" under the "Experience" section and in the "Social" sub-tab. You may also manually input this information to appear in the Contact Info sub-tab under the "Additional Information" section of the contact's record. To do this, simply go to the contact and click on "Edit". You can then enter the company name in the "Additional Information" section. It will not create a hyperlink to the company in Nimble, however, the work history will be visible and readily accessible on the contact's profile.